This Burma holiday is as much a walking holiday as it is a cultural tour, following an itinerary which has been carefully crafted to offer a truly authentic Burmese experience way off the beaten track. We do this from the start of the tour, staying in Keng Tong in Shan State and visiting the Akha and Ann tribes of the region. After flying to Heho, our hill trekking continues in and around Kalaw, the British hill-station where we base ourselves to explore various trails into the homelands of the Palaung, Danu and Pa-O tribes. 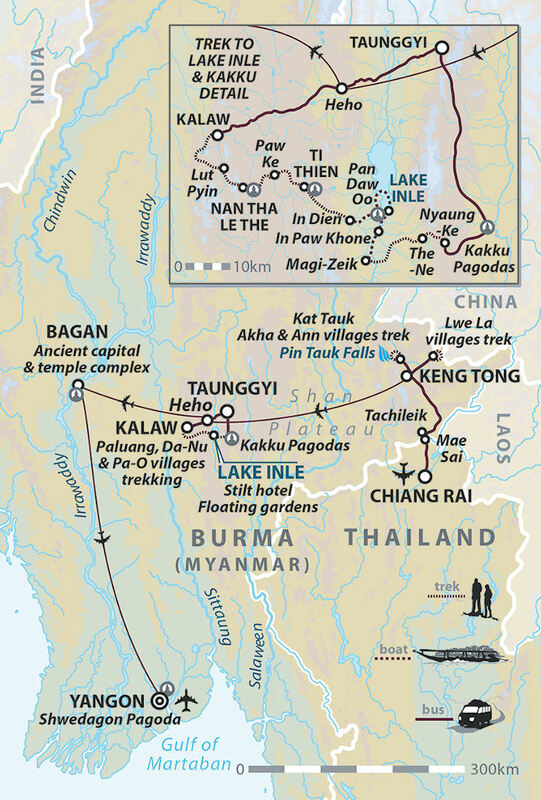 This section of the trip culminates in a two and a half day trek to Lake Inle, famous for its stilt house villages, floating markets and ‘leg rowers’. One more flight takes us to Bagan, home to the unforgettable sight of thousands of temples and pagodas peeking above the trees and mist, stretching into the horizon. A fitting finale for you to contemplate this trip through real rural Myanmar, before taking your final flight back to Yangon, the former capital with time to explore its Shwedagon Pagoda and many other heritage highlights. We believe that small group size is imperative, so we take a maximum size of 12 passengers on all of our trips. Not only does this allow us to use the road less travelled for a more unique experience, but it also helps to minimise our effect on the environment. From the very start of this trip to Myanmar, we make it clear that clients should ensure they leave no litter, and to be courteous to all locals, respecting local culture. In order to reduce the amount of plastic wastage, we also encourage clients to carry refillable water bottles. We help you to make a difference; all our flights are off-set by ‘Carbon-Clear;’ this balances out the emissions given out on your flights with the equivalent reductions in greenhouse gas reductions in another place. In Myanmar, we use a minibus rather than multiple jeeps for transport, thus also reducing C02 emissions. We have always believed that we should run all our trips in as responsible a manner as possible and let our clients decide for themselves if they wish to visit a certain country or not. Up until November, Myanmar (Burma) was accused of multiple human rights violations, the ruling military junta was thought to be beyond the pale, and an unofficial tourist boycott was in place. But at the end of last year, elections (albeit rigged ones) were held, the generals handed power to a ‘civilianised’ government and released Aung San Suu Kyi, the democratically elected leader, from house arrest. She then dropped her opposition to tourism, arguing that as long as it is done responsibly, tourism can be a positive stance for change. It is important to encourage tourism in Myanmar in the right way so that the local people, and not the corrupt and unelected government, make the most out of the presence of tourism. We feel that isolating Myanmar from the rest of the world gives the government carte blanche to operate in any way it chooses. By sending in more eyes and ears (in the form of tourists), the government becomes more accountable. Aung San Suu Kyi has recently made this same point. But how easy is it to travel responsibly? How does the ethical traveller make sure the money they are spending reaches ordinary people of Myanmar? Before launching our programme to the country, we went to find out. We found that ordinary Myanmar people certainly benefit from our presence, and were keen that we came. Whether this was one of the friendly touts trying to sell everything from a Buddha’s heads to grasshoppers, tonga drivers, local guides, boatmen, drivers or just the staff employed by the hotels and restaurants, it was very obvious there were plenty of ordinary people making a living out of tourism. Over the last three years, two of our most experienced guides have travelled to Myanmar on a number of occasions and came back with glowing reports of the country. They informed us of ways to run trips that put a minimum of finance into the coffers of the government, and a great deal into the hands of the ordinary people. In Myanmar, we have been especially careful to use privately owned hotels, and that all staff are private individuals. Great care is taken to make sure the hotels we use are not owned and run for the government’s own ends, or by their stooges, and are either owned by international chains or local businessmen, unaligned to the government. We will also be staying with a local community in Hsipaw and visiting many cottage industries, with the opportunity for people to purchase items and directly benefit the local people. There is no question in our mind that by using local, independent guides, the positive aspects of the experience for the tourist are greatly increased, as they can arrange all manner of cultural exchanges. Through the purchasing of locally made handicrafts, fruits, and curiosities - which the guide encourages - in turn adds to the benefit of the local population. In addition the money paid to the local guide goes directly in their pockets and from them in to the local community. Our company has grown up on the premise of encouraging local interaction that benefits both the tourist and the local. In Myanmar, we have all manner of cultural exchanges, probably the most notable being the involvement of our clients in the novice monks acceptance ceremony into the local monastery, which the tour sponsors; we pay for orphaned children to be integrated into the monastery, a practice all children want to follow but those without families struggle to achieve. We also make a substantial donation from each trip to a school for children that were orphaned by the cyclone in 2008. There is no doubt in our minds that the vast majority of Myanmar people want tourists to visit and it is clear that a huge number of ordinary civilians, both directly and indirectly, benefit, from our presence.